This page will be dynamic and updated as information becomes available. Updates will be highlighted with time stamps. 1320 WSKN Radio Isla is broadcasting via the emergency broadcasting system. You can listen using MyTuner Radio app. Today, President Donald J. Trump declared that an emergency exists in the Commonwealth of Puerto Rico and ordered Federal assistance to supplement commonwealth and local response efforts due to the emergency conditions resulting from Hurricane Maria beginning on September 17, 2017, and continuing. 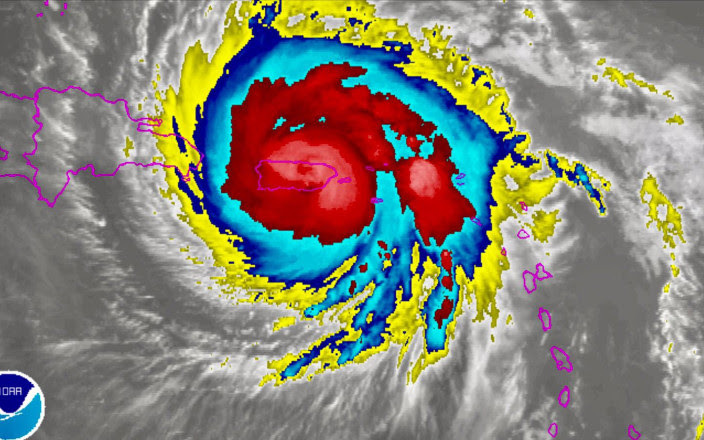 Hurricane Maria regained “major hurricane status” early Thursday as it marched toward the Dominican Republic, bringing heavy rainfall there even as Puerto Rico was battling extensive floodwaters. The eye of the storm moved off Puerto Rico’s coast Wednesday afternoon, but Maria was still causing catastrophic flooding on the island early Thursday, the National Weather Service said. By 1 a.m., flash flood warnings were expanded to cover the entire island. “If possible, move to higher ground NOW!” the National Weather Service office in San Juan said. • The death toll from Hurricane Maria has risen to at least 15 on the small Caribbean island of Dominica, according to Prime Minister Roosevelt Skerrit. Two people were also killed on the French Caribbean island of Guadeloupe, officials said. • Gov. Ricardo Rosselló told CNN late Wednesday that officials knew of only one fatality in Puerto Rico. • The United States Coast Guard reported the death of a man aboard a capsized vessel near Vieques, Puerto Rico. A woman and two children were rescued from the boat by a British Royal Navy helicopter crew, it added. • President Trump said Thursday that he would visit Puerto Rico, but gave no details on the timing of the trip. • In the United States Virgin Islands, Gov. Kenneth E. Mapp announced a 24-hour curfew for four islands until further notice. In Puerto Rico, Gov. Rosselló had previously set a 6 p.m. to 6 a.m. curfew effective until Saturday. • At least eight people died after drowning in different parts of Toa Baja, the mayor of the town, Bernardo Márquez, said in an interview. The mayor said that storm surge and river overflows had burst through open floodgates and that alarms did not sound when the floodgates were opened because of faulty maintenance. Three children and a police officer were among the dead, he said. The newly reported deaths came after Governor Rosselló told CNN late Wednesday that officials knew of one fatality in the commonwealth involving a man who was hit by a board. The United States Coast Guard also reported the death of a man aboard a capsized vessel near Vieques, P.R. • Forecasters say Puerto Rico will see up to an additional eight inches of rain through Saturday, adding to the several feet of rain that has fallen on parts of the island. Caguas, in the central mountains, has received the most rain on the island during Maria, 37.9 inches, according to the National Weather Service. • There is significant concern about the expected “life-threatening” storm surge of nine to 12 feet in the Bahamas and the Turks and Caicos, according to Michael Brennan of the National Hurricane Center. • President Trump said Thursday that he would visit Puerto Rico, but he gave no details on the timing of the trip. • In Puerto Rico, Governor Rosselló had previously set a 6 p.m. to 6 a.m. curfew effective until Saturday. On Thursday, he requested that Gov. Andrew M. Cuomo of New York help with recovery efforts. Governor Cuomo will travel to Puerto Rico with key emergency response officials as early as Friday morning, his office said in a statement. • In the United States Virgin Islands, Gov. Kenneth E. Mapp announced that a 24-hour curfew would be scaled back on three islands beginning on Friday morning. And although the full curfew remained in place on St. Croix, Governor Mapp said residents would be allowed to leave their homes to get supplies during a four-hour window on Friday. • In the British Virgin Islands, government officials issued an all clear at 9 a.m. on Thursday morning, lifting a curfew that had been in effect since 6 p.m. on Tuesday. A dam in northwestern Puerto Rico suffered structural damage on Friday, the governor said at a news conference, prompting evacuations of areas nearby in the aftermath of Hurricane Maria. The news about the dam was a dramatic sign that the scale of troubles left behind by the storm were just being understood. Power remained out and phone service was still limited. On Friday night, the governor was flying over to the dam area to see how serious the risk might be, said a spokeswoman for the Puerto Rico Emergency Management Agency. A flash flood warning was previously issued by the National Weather Service for the municipalities of Isabela and Quebradillas, in the immediate areas of the dam. “This is an extremely dangerous and life-threatening situation,” the service said in an advisory. Messages sent to the power authority about the condition of the dam were not immediately returned. The National Guard has been activated in the area, the governor said. According to the United States Army Corps of Engineers, Guajataca Dam is an earthen structure, 120 feet high and nearly 1,000 feet long. It was built in the mid-1920s by the Army Corps of Engineers, but is now owned by the power authority. It lies across the Guajataca River, forming a reservoir that can hold about 11 billion gallons of water that is used for drinking, irrigation and power generation. Sign up for the Morning Briefing for hurricane news and a daily look at what you need to know to begin your day. See how the storm traveled across Puerto Rico, and here is a guide on how to help victims. Aid is being sent to Puerto Rico. Officials in Puerto Rico were corralling incoming aid as rescue and recovery efforts continued after the storm, Mr. Rosselló said on MSNBC on Friday. 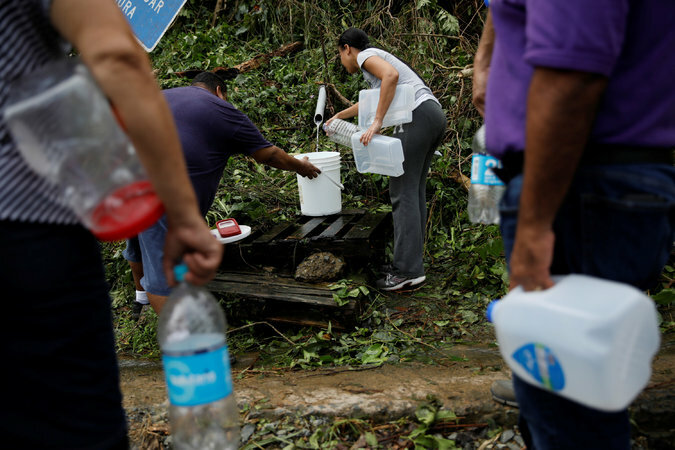 Mr. Rosselló said that the island was getting generators, mattresses, food and water from the Federal Emergency Management Agency, and from others in the private sector. Officials have established a logistics center, which will receive all incoming aid and then distribute it to 12 zones throughout the island, he said. “The people of Puerto Rico are really being tremendous under these circumstances,” he said. Some elderly residents had been found in rural areas without food and necessary medication, Carmen Yulín Cruz, the mayor of San Juan, said on CNN on Friday. 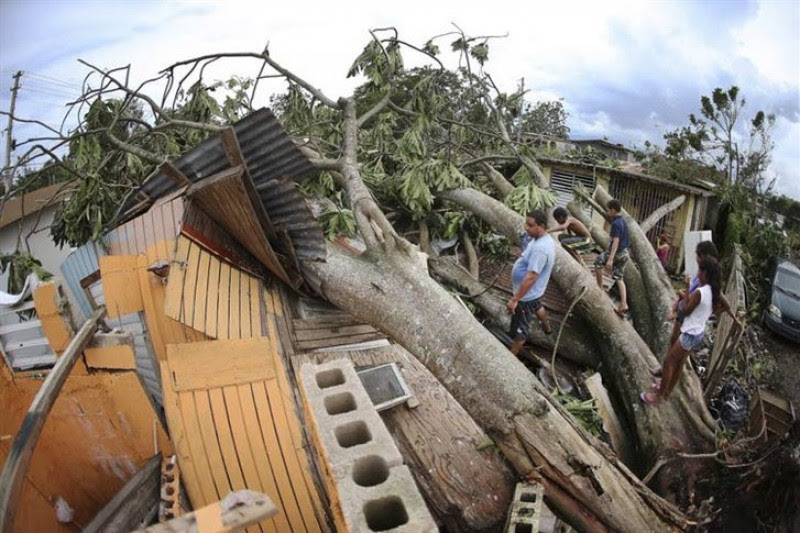 The Dominican Republic appears to have been spared the storm’s full force. Early reports indicated there was minimal damage to the country. In a statement late Thursday, the Ministry of Tourism said that the tourism industry was not directly impacted by the hurricane. The industry fuels a large portion of the economy. So far in 2017, at least five million tourists have visited the country. Punta Cana, La Romana and Samaná El Catey airports reopened on Thursday evening. Reporting was contributed by Campbell Robertson in Pittsburgh, Luis Ferré-Sadurní in San Juan, P.R., and Henry Fountain, Niraj Chokshi and Megan Specia in New York. IMPORTANT: at this time there are no reported deaths, but devastating reports of property loss, extensive flooding and the central region is on alert for both flash floods, mudslides and will get 2 more inches of rain by end of day. Levittown – Completely submerged, residents awaiting rescue from the roofs of their homes. San Juan – Extensive flooding, some reports of residents awaiting rescue from the roofs of their homes. Moca – Excessive flooding, Mudslides reported. Toa Baja -Completely submerged, residents awaiting rescue from the roofs of their homes. Phone Service is down in most of the island, some people are communicating via wifi thru mobile devices. Extensive flooding / roads undrivable in lower elevations. There is no place to purchase gas at this time. Radio Isla is broadcasting via the emergency broadcasting system. You can listen using MyTuner Radio app. Reports of gas stations opening. Limited cellular service in the metropolitan area. Reports of residents out clearing roads without government assistance. Curfew to potentially lifted after Saturday, The focus right now is keeping people safe. The Puerto Rican Diaspora has continued efforts to mobilize since Hurricane Irma. Here are the organizations that have launched initiatives. 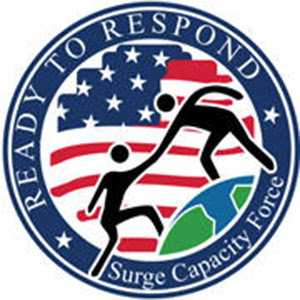 Disaster Recovery EffortUnited for Puerto Rico is an initiative brought forth by the First lady of Puerto Rico, Mrs. Beatriz Rosselló in collaboration with the private sector, with the purpose of providing aid and support to those affected in Puerto Rico by the passage of Hurricane Irma and Hurricane María. I saw that on my timeline, Pilli Montilla announced that Friends of Puerto Rico has started a fund to help rebuild Puerto Rico. In order to help build Puerto Rico after the passing of hurricane Maria, we’re raising funds that will be invested 100% in the Island. Friends of Puerto Rico is a national non-profit organization incorporated in Washington, DC. Our mission is to build the future of Puerto Rico. 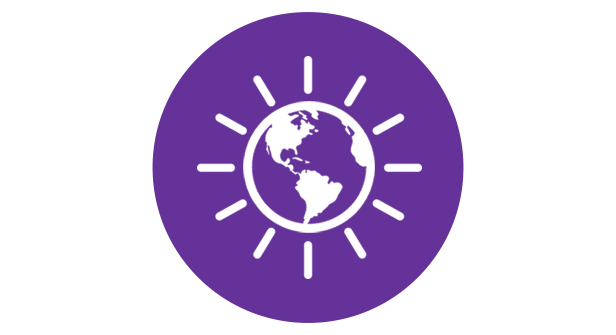 FPR provides direct financial support to nonprofits that have proven to be efficient and effective, which facilitates high-impact donations in the region. Our network of donors are business leaders from the Puerto Rican community, as well as the many friends of Puerto Rico in the Washington Metropolitan Area and beyond. Organizations and donors involved in the Friends of Puerto Rico events become part of our network, creating opportunities for partnership and collaboration across non-profits and donors looking to maximize the impact of their work. Our annual fundraising event, “Building the Future of Puerto Rico,” brings together our donors and the non-profit organizations that we have chosen to support that year. More information about our second annual event, held in June 2016, can be found here. All donations to this fund will exclusively support the victims of the catastrophic Hurricane María and Irma in Puerto Rico and provide relief and aid the communities affected by this disaster. This fund is managed by the non-profit ConPRmetidos. We anticipate the funds will be used first for immediate needs of food, shelter and water and then transition to long term recovery efforts. 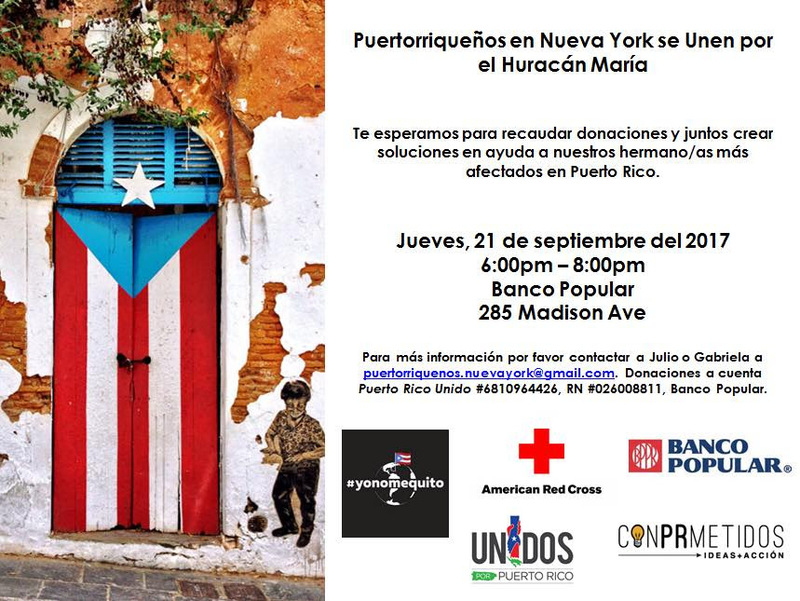 They also have a donation dropoff between 6:00 p.m. y 8:00 p.m. at Banco Popular located 285 Madison Ave in Manhattan, New York. In Orlando, several groups created the Support, Solidarity and Aid Coordinator for victims of hurricanes Irma and María (CASA), CASA is asking the Boricua community of Florida to donate and contribute to the facilities of the Acacia center in Orlando, one of the non-governmental organizations that integrate CASA. The Acacia Center is located at the 1865 North Econlockhatchee Train. You can also call 407-985-3735 or 787-504-3723. MANHATTAN: Casabe Senior Houses 121st St and Lexington Ave. Mon-Fri, 9am-5pm. BRONX: El Maestro, Inc. on Southern Blvd. Take #5 to Freeman Street. Mon-Fri, 2-8pm. BROOKLYN: Paul’s Parish Hall 334 South 5th St. Sunday, 1-5pm. VirtualBoricua Todos-Somos: Please support our disaster relief effort in East Harlem. Casabe Senior Houses at 150 East 121st Street near Lexington Avenue is accepting supplies (lanterns, batteries, flashlights, clothing, blankets, non-perishable foods, feminine hygiene and baby products). NO bottled water or money, please. Thank you! In this report we include a list of local events to support Puerto Rico’s disaster relief from hurricanes Irma and Maria and a survey of charities and local initiatives with direct access to the victims of these hurricanes where you can make donations directly. You can help by donating directly to charities in Puerto Rico that are leading the effort to mitigate the unfolding humanitarian crisis, or by attending events and other local initiatives where you can bring monetary or other types of assistance. Vitrual Boricua accepting supplies for another two weeks. There are two drop-off locations, East Harlem and the Bronx.